Maccaferri is a leader in the mining sector when it comes to prevention and improvements of mining infrastructures. Maccaferri’s presence in the mining sector is rapidly increasing. Wherever any problem occurs within the lifecycle of the mine, Maccaferri’s products and solutions can help improve safety and work. Northern Coalfields Limited is a subsidiary of Coal India, located in Singrauli, and is an excellent example of such improvements. Comprises of many open cast mines, which produce large quantity of waste through mining activities year after year. Continuous deposition of waste materials resulted in the creation of large unstable dumps. The dumps lead to excessive space consumption and cause environment hazards of great concern to mining operators: these dumps are high, steep and unstable. During monsoon, the unstable slope along the way to mines subsides, causing poor access to mines thus affecting mining activities, causing also road closure in Singrauli every year. The intercity connecting road and the road leading to new mines were vulnerable to these problems. Thus stabilizing the slopes was required. The restoration of the overburden dumps have been carried out by providing Maccaferri Gabion walls, placed at the toe of overburden dumps. 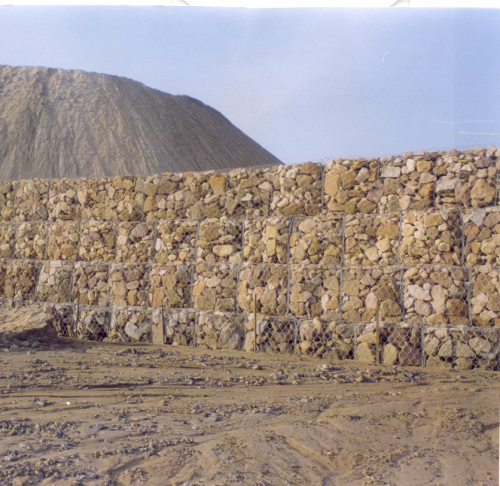 These Gabion toe walls help stabilizing the dump ranging from 30-100m. The protection of the slope surface against local slip and erosion was carried out with mulching and natural Geotextile (biodegradable fibers like jute, coir etc). Vegetation now covers dumps and ensures stability against local slips and erosion. The construction of gabion walls were completed in year 2000. The dumps are now successfully retained. The excellent drainage by Gabions and subsequent growth of vegetation on slopes has guaranteed stable and ecofriendly structure with a pleasing look. Our engineers paid a visit to the location and we, as solutions providers, are proud to present the look of gabion retaining walls just after construction and present look of the structure after 16 years: the structure is completely merged with the environment. Need more information, data, document? Do not hesitate to contact us.